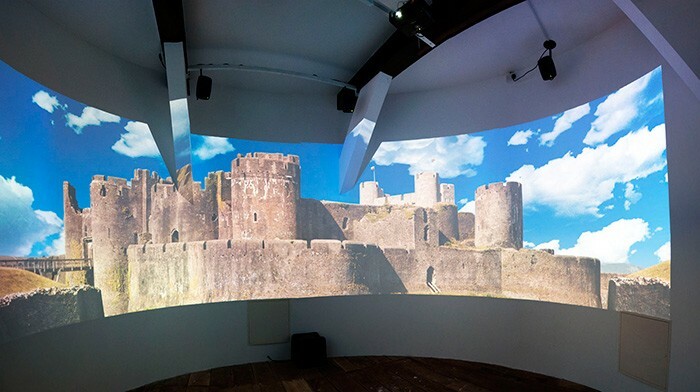 Ross Ashton and The Projection Studio have designed and co-ordinated a permanent 270 degree video projection installation featuring an adaptation of their highly successful work ‘Illuminata’ at Caerphilly Castle in Wales for CADW, the official guardian of the built heritage of Wales. The show was originally a large format projection extravaganza created by Ashton and projected onto two buildings in the Castle’s main courtyard for two short festival events in 2010 and 2011. This proved so popular and accessible that CADW wanted to integrate it as a lasting tribute to the colourful history of the Castle which could be enjoyed by the public all year round. Says Ashton: "I was very honoured to be asked to revise the show to run as a permanent work. It’s fantastic to see it have another lease of life and the chance to connect with so many more people in this re-worked format which really retains all the drama and essence of the original." 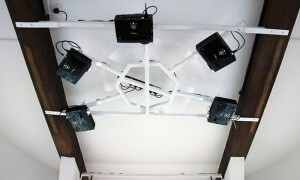 Five Optoma EW610ST projectors fitted with extremely short throw .52 lenses are used for the projections, which cover a surface area of around 3.5 metres tall (starting at about 80 cm off the floor) and 5.2 metres in diameter wrapping around the circular room which is skinned with a smooth white plaster finish. The projectors are rigged on custom mounts attached to the ceiling, focused out towards the circular walls. The Projection Studio undertook all the storyboarding in collaboration with Karen Monid, the sound artist for the piece, and image creation and the animations themselves were completed by Ashton and Paul Chatfield. The installed looped show is 10 minutes long, 50% shorter than the original, which was a challenge, however the end result is just as exciting, action-packed and informative. Other modifications were necessary to account for the fact that the images are now almost surrounding the audience as opposed to being viewed on two flat surfaces some distance away. The objective was to fill as much of the room as possible with the projection, so visitors can feel immersed in the animated images. The centre of the room was made the focal point and it was absolutely crucial that no shadows could be cast on the projections by visitors standing too close. The massive perspective correction needed, together with the soft edge blending of the five image sources is dealt with by a Watchout control system. There were large overlaps in the images and massive differences in the depth of field due to the short throw lenses. Using five projectors as opposed to four gave a centre image that needed no blending, which was a big advantage to the aesthetics and using five devices also allowed them to produce a taller overall image. "It took some serious calculations and understanding the physics of the matter to make the show fit into the space," explains Ashton. "In fact, even though it’s on a much smaller scale that we are usually working, it’s probably one of the most complex installations we’ve undertaken to date." A 6.1 accompanying soundtrack was compiled and mixed by Monid for the looped show, delivered through six Genelec 8020B speakers also hanging from the ceiling on special mounts, plus a sub bass unit on the floor. The Watchout control is located in the next room. It runs seven tracks of video and sound utilising an Echo AudioFire8 96kHz Firewire audio interface. The installation is already proving very popular and is one of a growing number of historical projected works produced by Ashton and his team worldwide.